“I love my hijab”, this is a message that UMWA activists came with to the main street of the country on February 1st, World Hijab Day. Women gifted flowers and motivating magnets to people on streets. They wanted to remind Kiev citizens that modesty is real power and beauty of a woman and hijab is one of its attributes. “Our goal is to break wrong stereotypes about Muslim woman as an oppressed person. We want to show people that hijab is graceful and beautiful. Covering the head is a part of Ukrainian tradition indeed, but many people forgot it” – said one of the activists. A similar event was held by the association activists In the city of Kharkov. It will be completed by hijab master class in “Al- Barakat mosque” on February 3. «The purpose of our organization is to change wrong social opinion about Muslim woman. We want to develop an intercultural dialogue to unite Ukrainian society and not to look for stumbling blocks that divide people. Our activists are Muslim women of different age and nationalities and we accept, understand and help each other. It is a good example for others» – says the association President Katerina Yurchenko. 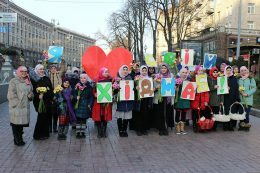 Ukrainian Muslim Women Association was founded in summer 2017. Though in such a short period it has to its credit several charity champagnes, educational events, and social projects.